In 1976(9th grade) I blew my right knee doing gymnastics. In '78 I had surgery, cartilage removed, pins put in place for something, no formal rehabilitation, but was able to remain active to some degree in cheerleading, tumbling, softball, golf I learned to "compensate" the bad knee with the good(left) knee. 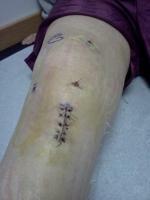 2006(45yrs old) my "good" knee had enough and ACL was torn while playing tennis. ACL replacement with my hamstring tendon, a great surgeon, great physical therapy, and I was back to playing tennis.... but still had the "bad" knee to worry about. 2009, bad knee goes...this time my surgeon could not really even tell what could be done since it was SO bad. First thoughts were total knee replacement but we ultimately decided to scope, clean it out, and "see what was in there". He told me it was a crap shoot on if I would be better or worse after surgery. He went in with the option of replacing the ACL if needed. My surgeon replaced my ACL with a cadaver tendon as it was a non-functioning ACL that was somehow functioning for many years. My right knee is bone-on-bone but I am happy to say I now have a functioning ACL which surprisingly has made a positive change.... I have a much better degree of bend in this knee although I still have bone-on-bone aches and pains of which I am used to. I am in my 5th week since surgery, completely straight and have a 124 degree bend. I can do stairs comfortable but cannot do full single leg dips... it seems like a foreign movement for this knee and causes my back to twinge when I attempt it. I am determined to conquer that skill however. I am a PE teacher and am able to lead low impact exerices and stretches with my classes and have even been on the tennis court to work on my serve. My goal is to be back on the court playing doubles by the end of March which will be week 15 of surgery. Any thoughts on that goal would be appreciated.